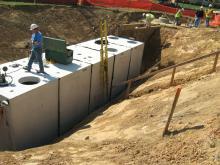 In New England they are called "Tunnel Tanks" in other states "Box Culvert Style Tanks" Often used to store water, or as a large commercial septic tank. They cannot leak. Copyright © 2019, JEPCO Sales.